Author Brings GUITAR At The Miami Book Fair 2018! MIAMI, FLORIDA, UNITED STATES, October 30, 2018 /EINPresswire.com/ — The books are definitely coming to downtown Miami as the nation’s finest literary festival, the Miami Book Fair International holds its annual celebration. This eight-day literary party will commence on November 11 with over a hundred-thousand readers and writers in attendance. Distinguished authors from the United States and other parts of the globe, as well as book lovers, will be gracing the Fair and its many activities. AuthorCentrix celebrates its second year as one of the exhibitors at the Fair. The company will be gracing the event with Kenneth Jackson, a published author and guitar lover. This year at the Fair, he brings to the readers, a special piece that serves as a manual for all those who play the guitar and those who would want to play it. A chance for one-to-one Author Interview and Book Signing with Jackson await everyone! 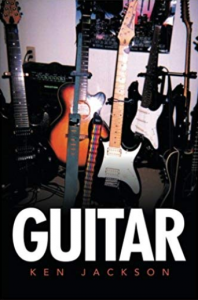 Ken Jackson’s GUITAR presents a monograph for all the guitar players who have dedicated their lives to music. Jackson considers music as the medicine of the mind and he wants to share his expertise for those who want to play guitar. The book serves as a manual, intended to help everyone learn about scales, chords, and the structure of songs. He encourages everyone to enjoy swinging guitar with fervour!